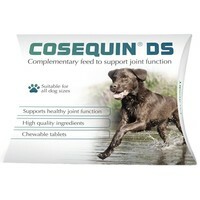 Cosequin is a quality veterinary glucosamine and chondroitin mix for dogs to aid in maintaining optimal joint function, cartilage production and to protect existing cartilage from breakdown. Cosequin should be used initially for a six week period, after which the number can be reduced gradually to achieve a maintenance level for your dog. The quantity administered should not be reduced more than once a month but may be increased at any time depending on your dog's needs should a flare up occur.